Presenting offers is part art, part science. The science part is the analysis you and your agent will do to examine recent comparable sales, the over market conditions, and the perceived attitudes of the seller to determine the correct offering price. The art is how you present it, and whether you give yourself the best chance of getting your offer accepted. Ultimately, the goal of shopping is buying. And at some point during your home search process, you’re going to find something that you’re interested in buying. You’ll be interested in the first showing, go back for a second look, and, if you’re like many of our buyers, return a few more times “just to make sure.” At the end, though, if this is the home you want to buy, you need to start the transactional process by making an offer. When you make your offer, you will set out basic terms upon which you are willing to purchase the home. If you and the seller come to agreement on those terms, the agents will send the offer to the attorneys for purposes of drafting a contract. At this point in the process, you’re not legally bound to the terms of your offer, but obviously you should only present an offer that you are willing to commit to in good faith. From a procedural standpoint, the initial offer in a negotiation is usually prepared on a form provided by your agent. You will fill out the terms of the offer with your agent, and your agent will then send it to the seller’s agent for review. After that initial offer, most of the follow-up counter-offers are done over the phone or email between the agents, until ultimately you reach an agreement that is memorialized in a final term sheet that the agents will send to the attorneys to advise them in preparation of the contracts. •Purchase Price. This is obviously the most important term – the most important for you, and the most important for the seller. We’ll discuss pricing your offer in more depth below. •Down Payment. The down payment is the amount that you will deposit when you sign contracts – NOT when you make the offer – as a show of good faith commitment to purchase the home. Down payments are generally between 5%-10% of the purchase price. •Closing Date. The estimated closing date is really just an estimate. You’re not bound by the closing date even in the contract, so most agents just set a projected date three or so months for the future – which is the average time it takes to get from contract to closing. •Personal Property. When you buy a home, you buy all the fixtures in the home – everything that is attached to the property. But sometimes, you might find that the seller has “personal property” that is not legally affixed, but is so perfectly situated to the home that you want to buy it along with the property. The legal default position is that only fixtures stay with the home, so you’ll need to identify any personal property that you want to buy as part of your purchase price. •Mortgage Contingency. When you prepare your offer, you’ll have to consider whether you want to demand a mortgage contingency, which allows you to terminate the contract without penalty if you are unable to get a mortgage after a good faith effort. You will probably want the reassurance of a mortgage contingency, but that might be something that the seller will resist. •Inspection Contingency. Sometimes, the offer sheet will explicitly state that the offer is subject to inspection, but it’s not absolutely necessary because inspections are usually completed before contract anyway. •Other Contingencies. You might have particular needs that should be addressed as conditions, such as the need to sell your home before you close on your purchase. It’s generally not a good idea to spring unusual requests in the contract, so if you have anything you need that’s out of the ordinary, make sure you discuss with your agent whether you should present it as part of the offer. Of course, your offer might contain other terms that we haven’t addressed, but generally speaking those are the main issues that get presented as part of the offer. Obviously, the most important term of your offer is the price that you are will to pay to purchase the home. All the other issues – down payment, closing dates, contingencies – are generally minor areas of negotiability. In most cases, the main issue is price. 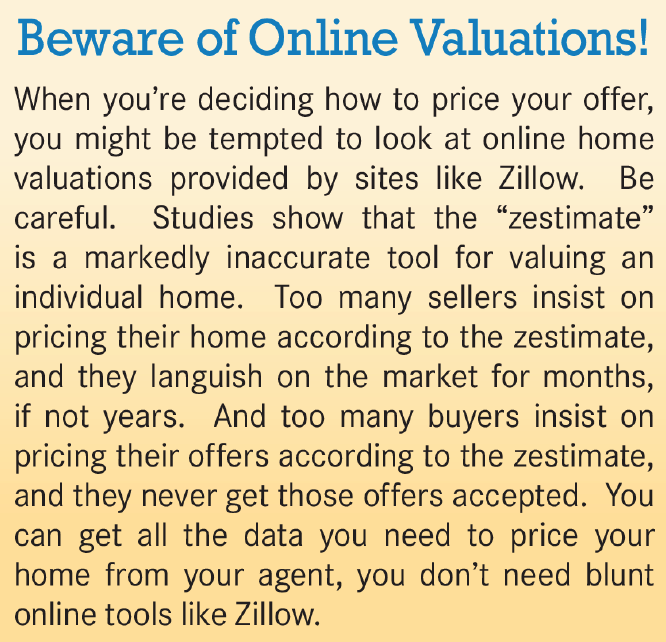 Ultimately, of course, your pricing strategy depends on what that home is worth to you. You’ve already gone through the process of determining how much you can afford, and used that information in identifying your price range and choosing the homes that you evaluated with your agent. You’ve been watching the market, and at this point you should have a pretty good idea of what homes are selling for. The question now becomes, “what are you willing to pay to own this home?” And if you can afford that price, then that becomes your target goal for your negotiation. Similarly, you should never make an initial offer that is the most you’re willing to pay for that home. Some buyers do that in an attempt to short-circuit negotiations, and in some cases to convey that they are serious buyers: “here is our best price, but that’s as high as we can go.” Don’t do that. Very few sellers accept an initial offer, and from a psychological standpoint they need to comfort of engaging in at least some negotiation on the price of their home. So set that initial offer in a way that you have a little wiggle room, so that you can accept, or counter, the seller’s counter-offer. Here’s one rule of thumb to keep in mind: most deals close within three or four rounds of negotiating. That is, (1) a buyer presents an initial offer, (2) the seller counters, and (3) the buyer either meets the counter or (4) presents a new offer that the seller accepts. Most successful deals come together in a matter of days, if not hours, so prepare your negotiating strategy accordingly. So with that general strategy in mind, how do you determine what price to offer? The basic rule of thumb is that an initial offer, to be taken seriously, should be about 5%-15% off the current listing price. That’s obviously a very wide range, but that’s the point – it’s just a general guideline to help you stay in the “sweet spot” between over­ bidding and low-balling. The actual offer you make will depend on your particular situation: what comparable homes are selling for, the current state of the market, and the history of that individual listed property. Just remember that when you’re looking at sold data, you’re getting information about closed sales, which reflects the state of the market from a few months ago. That is, those closed sales were put into contract months earlier, and then spent time going through the transactional process to get to the closing table. So if the market is very active, some of the sold data might already be out-of-date. Unfortunately, the sale price of homes that are “under contract,” which are more recent comps, are not publicly available, even to your agent, so you don’t have access to that data. It’s also important to remember that not all homes are easy to compare to recent sales. Particularly in high end markets, you’re not likely to find a lot of recent sales at the same price point in the same area, so comparable sales data will not be as helpful. Second, be mindful of the current negotiability in the market. If you have been reading the Rand Quarterly Market Report, or getting market reports from your agent, you know that we consistently measure the “listing discount” that sellers are giving to buyers off the last listed price for the home. In the past few years, the regional listing discount has hovered at the 5%-7% mark, which from a historical perspective is highly negotiable. But that’s a regional number, so the negotiability might be different in your particular town or village or at your particular price point. So the more local, and more recent, the negotiability information you have, the better. Indeed, pay particular attention to the negotiability of those recent sales. If you see that homes are selling for very close to the asking price, you’ll want to adjust your initial offer accordingly. Moreover, we should caution you that as a market heats up, you can expect negotiability to fall significantly. As buyer demand increases, sellers become far less negotiable on price. The average listing discount during the last seller’s market was closer to 1%-2% of the last listed price, and multiple bid situations became very common, pitting buyers against each other and driving many sales to above the asking price. Third, keep in mind the current status of the listing. Your agent can give you the history of the listing, which can be important in helping you formulate your initial offer. For example, you’ll want to know how long the house has been on the market. The longer the home has been for sale, the more likely the seller will be to reasonably negotiate on price. Similarly, you’ll want to know whether the seller has recently reduced the price. That’s important for two reason: first, because sellers are going to be less negotiable on price if they just made an overall reduction; and second, because homes that have recently been reduced in price tend to generate more buyer interest, which means you could be more likely to get into a bidding war that would dramatically reduce negotiability. As the housing market heats up, you might find yourself in a multiple-bid situation – where a seller gets offers from more than one buyer, negotiates with all buyers simultaneously, and ultimately requests that the interested parties submit their “highest and best” offers to close all discussions. If you’re in that situation, you’ll need to consult with your agent about how to prepare your offer, which requires you not just to consider all the variables about the market and the listing, but also what other buyers might be willing to pay for that property. Procedurally, what you’ll do is present your highest and best offer along with the other buyers, the sellers will then compare them, and then come to an agreement with whichever offer they prefer. A multiple bid situation can be very stressful, so as the market heats up we strongly advise you to move from accepted offer to contract as soon as possible. •Comp information. If your offer is significantly below the asking price, your agent might submit a list of comparable sold properties that you both believe justifies the price you’ve offered. Now, the seller might disagree with your selection of comps, but at least you’ve given the seller something to think about and justified your offer – which might soften the blow of an offer that is disappointingly below ask. •Financial Documentation. Sellers will take you more seriously if you provide some form of financial documentation with your offer – even if it’s just a preapproval letter from a reputable lender. Realize that the seller takes a risk in accepting an offer from a marginally qualified buyer, because the time spent waiting for that buyer to unsuccessfully get a mortgage is time that the seller was not actively on the market. •Personal Letter. In situations where you know other buyers are interested in the property, a personal letter can sometimes humanize your situation and forge a relationship between you and the seller. This was a common practice during seller’s market for buyers to make a personal appeal to sellers to accept their offer, stressing things like how much they love the home and are eager to raise their family in it. Most sellers will make a decision based entirely on price, but you’d be surprised how often they will agree to an offer based partly on their impressions of the buyer. These letters can sometimes be effective. Generally, you should not expect any seller to accept your initial offer. Simply out of reflex, sellers will usually make a counter-offer instead. At that point, you and your agent will have to negotiate the sale. Finally, remember that you are not legally bound by any of the terms in your offer until you execute formal contracts of sale with your attorney. 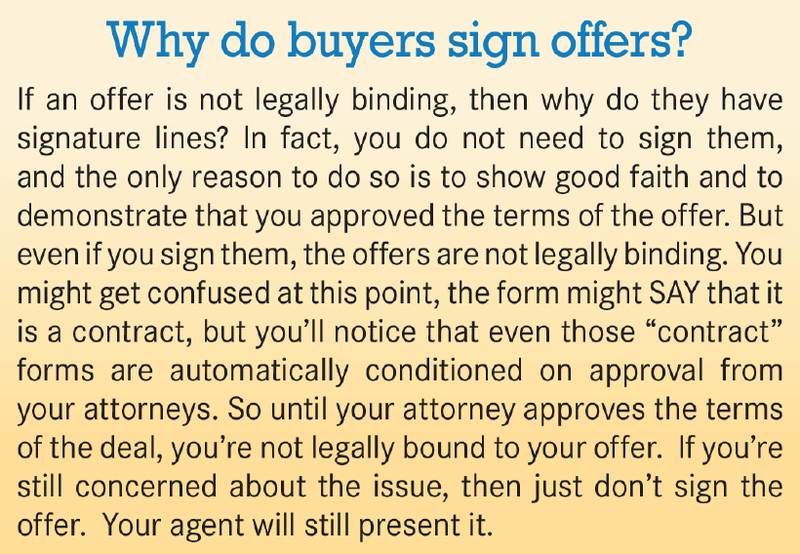 Even if you sign the offer, your agreement is conditioned upon attorney approval, so you are not obligated to buy that home until you execute that contract of sale. This is a double-edged sword, because it also means that the sellers are not bound to sell you the home until THEY sign a contract of sale. That’s why we encourage you to move quickly once you have an accepted offer, so that you don’t give time for other buyers to jump in and make a higher offer.